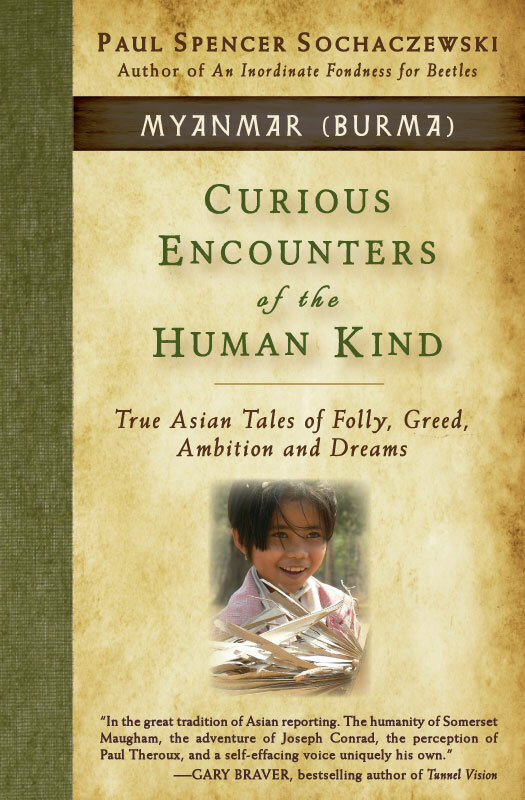 This is the first book in a five-book series of unusual (and true) personal travel tales. Within the first three days of the book’s publication it has become an Amazon best-seller in its category. 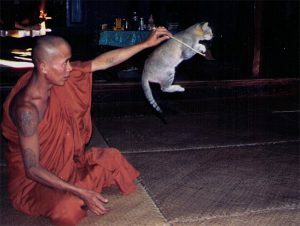 What do jumping cats have to do with Buddhism’s Middle Path? Did Orwell really hate everyone in Burma? How did Myanmar’s ruling junta use white elephants to consolidate their power? Will a synagogue caretaker’s improbable dream ever come true? What arrogance drives western travelers to seek the “unknown” in Myanmar’s Nagaland? And why should you never disrespect the nat spirits who guard a sacred forest? This is Myanmar as you’ve probably never imagined, full of curious people, startling happenings and unexpected moments of humanity and introspection, giddiness and solemnity, avarice and ambition. Tina Turner does it, Tom Cruise does it, so does Arnold. Is the Middle Path suitable for trained felines? Can rare pale pachyderms make a ruler righteous? What’s a more powerful conservation incentive — a government jail or a spiritual punishment? Is training cats one way to achieve the Middle Path? Our ginger cat in Geneva was doing what cats everywhere do – exactly what she felt like. Which at this moment was not jumping through a hoop. I was trying to accomplish a similar coup de persévérance to that which some monks in Burma have achieved. Teaching cats parlor tricks. But Brochette wasn’t buying it. What did the monks have that I didn’t? Lots of patience and an abundant supply of Friskies, as it turned out. I was introduced to the famous Burmese jumping cats at the Nga Phe Kyaung monastery, on Inle Lake. The “jumping cat monastery” is a key stop for the trickle of tourists who visit Burma. There I met Venerable U Nanda, 25, one of a dozen resident monks. “It’s easy to train cats,” he said, somewhat reluctantly putting down his Burmese comic book. With a large dose of ennui he explained that you simply start when they’re kittens, scratch them under the chin, say kon, and reward them with kitty treats. Obviously, it works. Every 30 minutes or so, when a group of visitors would accumulate, San Win, an assistant in the monastery, would put the cats through their paces. “What’s that one called?” I asked, pointing to a black and white tabby. I held the wire hoop in front of Arnold Schwarzenegger,” paradoxically one of the skinnier cats in the temple. I gave him a little nudge, ordered him to kon, and after he jumped I rewarded him with a biscuit. After a while U Nanda started to open up. Perhaps he saw that since I wasn’t going to go away he might as well have a discussion. I was interested in Buddhist history, he was interested in conjugating English verbs. Throughout our conversation, the abbot, Sayadaw Kite Ti, 68, kept his distance and read a book. I don’t read Burmese, but from the pictures of cowboys and horses I was pretty sure that it wasn’t a religious text. He didn’t glance up as visitors stuffed tattered kyat notes and a few dollar bills into the offering box. I left Inle Lake to travel around Shan state, and returned a few weeks later and sought out U Nanda. I felt I had unfinished business with the young monk, a feeling that there was more to him than a saffron-robed feline-inclined impresario. “You again,” he said when I walked in. He wasn’t hostile, but he wasn’t overly welcoming. “What do you do?” he eventually asked me.